As a student of the Royal College of Art in London in the 60s, Derek Boshier met David Hockney and Allen Jones, other fellow students of the institution. This group of friends will become the British Pop Art avant-garde. From his graphic work for albums of bands like The Clash and David Bowie, Boshier achieved popular recognition, allowing his art to reach a wider audience. But one thing to highlight about Boshier’s work is his constant experimentation. The artist works different concepts in each of his series. Although he always uses vibrant colors, his palette varies in time. The evolution of his work is evident: while in the 60s he was devoted to strictly pop paintings, 20 years later his works became more figurative and now, his compositions are more conceptual and abstract. Drinka pint milka is an example of the first pop period of the artist. Like all pop art, shows consumer goods such as milk or Cadbury® chocolate. However, it also shows human figures as consumer goods. 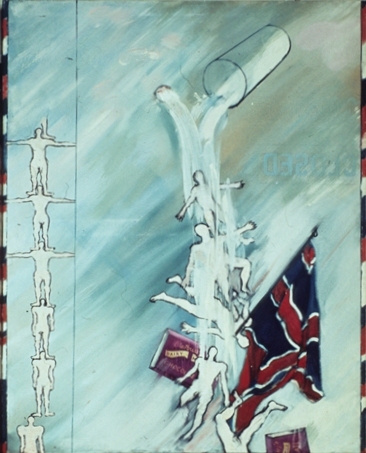 While at the left we see the figures on top of each other, to the right we see them messy, falling towards the lower end of the canvas next to the rumpled British flag. Boshier, in this painting, unlike, for example, Andy Warhol, makes a statement about the consumer society: the human figures are anonymous, as produced in series, which is evident in the left area of the work. On the right, we see them falling along with the milk from the glass. It seems like the artist wants to portrait men defenseless against the saturation of advertising. The name of the painting, ironically, represents a slogan, a catchy, musical phrase, which suggests (imperatively) consuming a product. ~ by Álvaro Mazzino on February 24, 2012. Drinka Pinta Milka Day was an advertising slogan of the Milk Marketing Board in the UK and appeared in TV commercials. Cadbury’s also used milk poured from 2 glasses to show the amount of milk in its chocolate bars. So the commercial references to advertisements in the picture would have been very strong when the image was produced. More so than today perhaps. Hey Jared. Good info to have in mind. Thank you very much! This entry was posted on February 24, 2012 at 12:22 and is filed under Pop art.You can follow any responses to this entry through the RSS 2.0 feed.You can leave a response, or trackback from your own site.